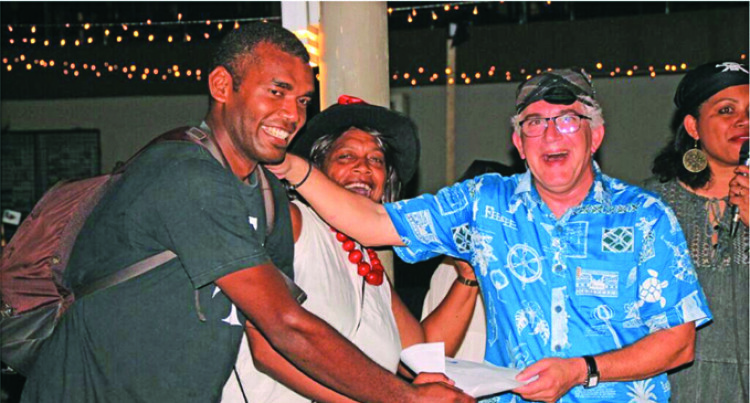 The Radisson Blu Resort Fiji had a twist to the an­nual Christmas party and awards ceremony last friday with a pirate theme. It was an extra special occasion for all team members as staff wer­e encouraged to attend the event in pirate costumes in line with the fully themed venue styled by Us­aia NP Weddings and Events Fiji. The party was attended by 235 of the hotel’s employees which was also a celebration of excellent employee performance with the resorts Annual Employee Awards for 2018 recognizing the Grand Prize Winners in 3 prestigious categories: Leader of the Year, Front of the House Employee of the Year and Back of the House Employee of the Year. “These awards are the high­est level of recognition an em­ployee could achieve after first qualifying for the quarter awards through nominations received from staff votes and Depart­ment Heads feedback based on the resorts service philosophy of ‘Yes I Can!’ Attitudes and per­formance”, says Charles Homsy, General Manager of the Radisson Blu Resort Fiji. The upcoming New Year’s Eve party at the hotel’s beachfront will also have full pirate them­ing, live DJ, food stations, fire­works display and prizes for best dressed. Following on from the success of last year’s Big Bula Beach Party, the Radisson Blu Resort hopes to attract around 500 guests in at­tendance again. “The team and I are excited about 2019 as all our 270 rooms will be fully refurbished by the end of January with lots of excit­ing upcoming projects in the pipeline for the hotel,” says Charles Homsy. Radisson Hotel Group is one of the world’s largest and most dynamic hotel companies and includes 1,440 hotels in operation and under de­velopment with more than 230,000 rooms and a footprint spanning 115 countries and territories. The Radisson Hotel Group portfo­lio includes a powerful set of global brands: Radisson Collection, Radis­son Blu , Radisson , Radisson RED, Park Plaza , Park Inn by Radisson and Country Inn & Suites by Radis­son. Over 95,000 people are employed in Radisson Hotel Group hotel systems and the company is headquartered in Minneapolis, Singapore, and Brus­sels. To find out more about Radisson Blu Resort Fiji, please click https://www.radissonblu.com/en/resort-fiji.